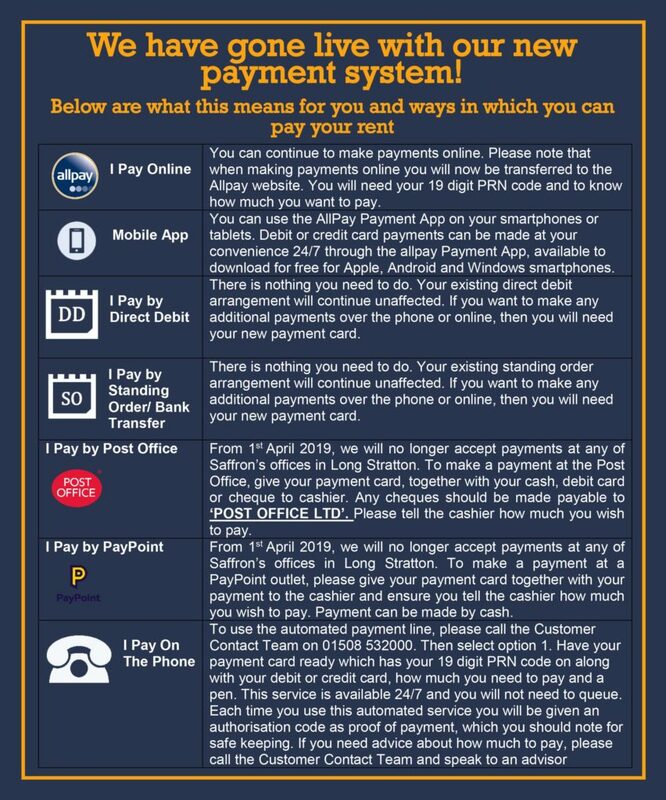 We recently sent you a new payment card and explained that we are investing in an improved payment system which gives you more ways to pay your rent, making it easier, safer and more convenient. Today it has gone live and you can start to use your new payment card! If you pay at the Post Office or PayPoint, you will not have received a new payment card as you can continue making payments using your old payment card. Your old card is valid for all methods of payments including Post Office, PayPoint, online and on the phone. Below is a table to show you what the changes mean for you. For some of you there is nothing you need to do and for others you might have a slight change. All this information has been uploaded to our website as well and can be found here. Please note that if you do pay online via our website you will now be transferred to the AllPay website. If you have any questions then please don’t hesitate to contact us on 01508 532000.